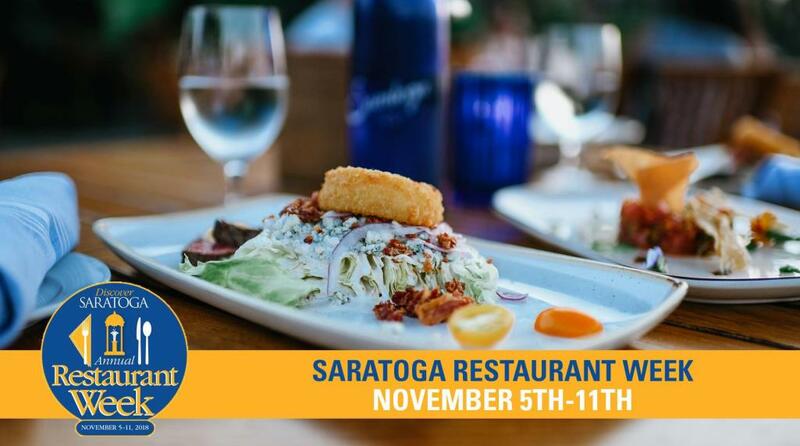 SARATOGA SPRINGS, N.Y.— Discover Saratoga is excited to announce the brand-new date for their 14th Annual Restaurant Week: November 5-11. The week-long celebration of Saratoga culinary delights offers locals and visitors alike a glimpse into the unique dining options within Saratoga County. Nearly 50 participating restaurants will serve up a variety of prix fixe menu options ranging from $20 and $30 three-course dinners to $10 lunch specials (plus tax & tip). Saratoga Restaurant Week, which is presented by Discover Saratoga and Spa City Brew Bus, provides an opportunity for event attendees to enjoy all Saratoga has to offer, in addition to dining at fabulous restaurants. After enjoying your choice of an appetizer or salad, dinner entrée and dessert, savor your stay in Saratoga by utilizing special hotel rates for Restaurant Week-goers at participating hotels. For menus, participating restaurants, special hotel rates, and more information about Discover Saratoga’s Annual Restaurant Week, visit www.discoversaratoga.org/restaurantweek or call 518-584-1531. Hotel and restaurant reservations are encouraged.